Our Communication Major teaches the importance of accurately communicating truth in an attitude of love. Our courses, taught with a Christian worldview, seek to develop individual character as well as your ability to reason and use clear expression. We seek to equip students to be well-informed, communicative contributors to society and God's work wherever they go. 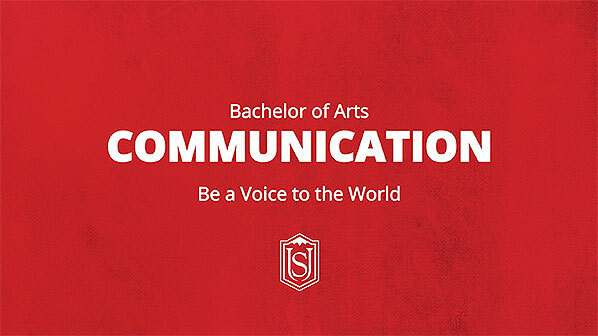 A communication major opens the door to multiple career opportunities, including public relations, marketing, journalism, teaching, politics, law, research, sports information, event promotion, and much more. Communication Models & Theory: Students will comprehend, understand, and apply communication models and theory in diverse practical contexts. Students will be able to develop content that reflects ethically appropriate communication in multiple contexts. Students will be able to understand and demonstrate appreciation of the cultural values, diversity and unity of a multicultural world. Communication Artifacts: Students will be able to evaluate, analyze, and synthesize communication artifacts with skill in relating them to similar communication products. Information Literacy: Students are able to recognize when information is needed and have the ability to use the appropriate methodology to discover, evaluate, and utilize the appropriate evidence in communicating messages. Communication Ability: Students will be able to communicate orally and in writing with advanced proficiency.